CNN promoted its coverage of Tuesday's State of the Union address by describing it as "President Trump in Nancy Pelosi's house." The language gave it the appearance of a sporting event rather than a solemn address by the president of the United States before a joint session of Congress. The promo also appeared to be playing up the rivalry between the two political leaders now that Pelosi's Democrats have taken the House majority. Trump and Pelosi sparred over the timing of the State of the Union during the partial government shutdown, which began in December and lasted 35 days. 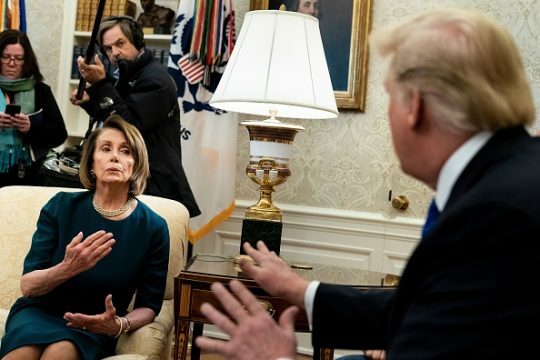 Pelosi said Trump could not speak on the House floor until the shutdown was over, and Trump eventually deferred and said he would do so after the shutdown was over. The impasse was over funding for the wall Trump plans to build at the southern border. The president did not get any money from Congress for it upon signing a continuing resolution on Jan. 25 to re-open the government, marking a major political victory for Pelosi. Trump has indicated he could shut the government down again on Feb. 15 if the Democrats don't agree to provide money for the wall. This entry was posted in Politics and tagged Barack Obama, Donald Trump, House of Representatives, John Boehner, Nancy Pelosi, State of the Union. Bookmark the permalink.